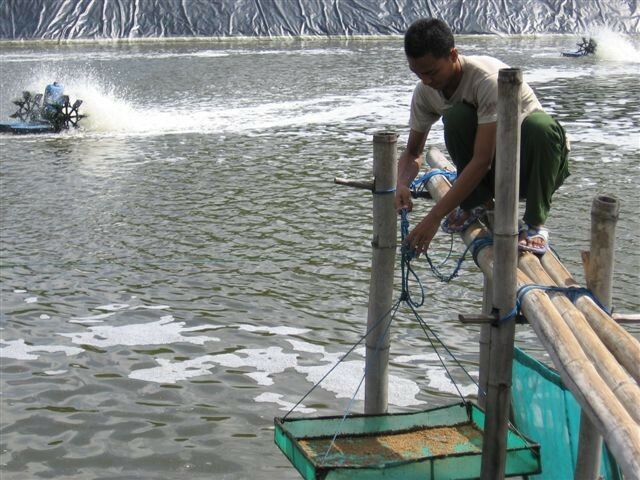 Photo of farm shrimp operations in Thailand by Matthew Thompson, Aquaculture Specialist New England Aquarium. Taken on a recent joint trip made by staff of the Aquarium and Ahold USA. With traditional fishing communities, and world-class crab shacks, New England has long been a hub for seafood. More recently, the New England Aquarium has taken a lead role among conservation organizations encouraging the seafood industry to think about long-term sustainability. The Aquarium hosts dinners with Boston’s top seafood chefs. They also began working with supermarkets to look at the items behind seafood counters. The Aquarium and major seafood retailers make unlikely bedfellows. Public Radio Kitchen set out for some informal conversations to find out more about what their partnerships look like, and what these groups hope to gain by working in concert. No one volunteered numbers on the program’s impact–not least because so many different pieces have been involved. Ultimately, it’s hard to know how big an impact this partnership has had so far. However, everyone involved agreed that progress in sustainable seafood will depend on those customers. The University of Rhode Island’s ‘Sustainable Seafood Initiative’ has resources you can use to get educated on eating seafood sustainably. This entry was posted in Public Radio Kitchen on April 21, 2010 by . Emma, when you say “world-class crab shacks,” do you maybe mean clam shacks? I didn’t. Should I have? I think we’ve got some of both in the NE.